Official sources said that while the state cabinet has approved the upped estimates of the second phase of the Metro rail, which comes to about Rs.1,116.60 crore, an official announcement to that effect would be made later, as the state assembly is in session. The Central government is set to spend Rs.344 crore for this project, and the Delhi Metro Rail Corporation (DMRC) will spend Rs.256 crore. The Uttar Pradesh government was to have spent Rs.991 crore earlier; the share was later raised to Rs.1,116.60 crore. A decision was also taken to divide the cost that the state government would bear between four departments – the Ghaziabad Development Authority (GDA), the Ghaziabad Municipal Corporation, the State Industrial Development Corporation, and the Aawas Vikaas Parishad. According to officials, the distribution of the budget for the Metro line into the four departments was a tedious exercise, but "settled now". "A meeting with regards to the budget allocation was presided over by the chief secretary and the issue was taken care of," a senior official said. According to the plan approved by the state cabinet, the GDA would be spending Rs.525.10 crore, the municipal corporation Rs.185.90 crore, the UP State Industrial Development Corporation Rs.73.20 crore, and the Aawas Vikaas Parishad Rs.332.40 crore. The second phase of the Metro rail was approved Oct 17 last year by the state cabinet. This phase in Ghaziabad will extend from Dilshad Garden in Delhi to the New Bus Terminal in Ghaziabad near the Mahamaya Sports Stadium. The detailed project report (DPR) on a new alignment from Dilshad Garden to New Bus Terminal along Grand Trunk (GT) Road in Ghaziabad was submitted to the Ghaziabad Development Authority (GDA) in April 2012. The 9.41-km corridor will provide an alternative to the current Anand Vihar-Vaishali line. Officials said the second phase would have seven stations – Shahid Nagar, Raj Bagh, Rajendra Nagar, Shyam Park, Mohan Nagar, Arthala and the New Bus Terminal in Ghaziabad. The average distance between each of these seven stations would be 1.35 km. The second phase of likely to benefit more than 1.2 million residents and commuters. With budgetary allocations done, and some other "teething trouble" taken care of following a "clear-cut message from the chief minister's office to fast track the Metro rail project", a senior official said it would only be a matter of time before the project gets rolling. "The necessary clearances, the budgetary provisions are all in place now. The chief minister hopes to see the second phase of Metro rail in Ghaziabad very much in stipulated time lines," the official said. The Ghaziabad Development Authority (GDA) on Saturday got a detailed project report (DPR) for the proposed 2.7-km Metro line connecting Noida’s Sector 62 to Indirapuram. According to the DPR submitted by the Delhi Metro Rail Corporation (DMRC), total cost of the project has been fixed at Rs. 764 crore. Sources in the GDA said that the UP government would have to bear Rs. 371 crore for the project. The Metro extension was proposed by the authority in June last year to provide better commuting facility to the people living in Indirapuram, Vasundhara and nearby areas. If the project goes through, the proposed extension would become the third link within Ghaziabad. GDA vice-chairman Santosh Kumar Yadav said that the authority was exploring the various sources from where funds could be generated for the project. “We are analysing the DPR submitted by DMRC. We will hold discussions with DMRC officials soon. We are also analyzing the project cost and looking for revenue generation options,” Yadav told HT. According to sources, the generation of funds for the project will be a major worry for the GDA as majority of private developers have already availed hiked floor area ratio (FAR) for construction activities in the areas along the proposed Metro line. The second phase of Metro in Ghaziabad — Dilshad Garden to New Bus Stand route — is waiting for the signing of memorandum of understanding between the DMRC and the GDA. The total cost of the 9.41-km line to be borne by the UP agencies stands at Rs. 1,116 crore, averaging about Rs. 118 crore per kilometre. 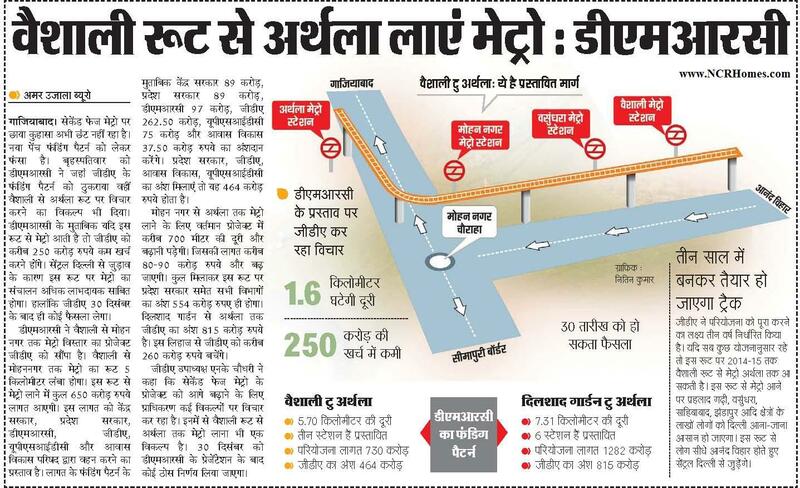 On the other hand, the 2.7-km Indirapuram link is likely to cost the state government Rs. 139 crore per kilometer. This proposed route will have two Metro stations at CISF and near DPS Indirapuram within Ghaziabad. At present, the Metro operates on mere a 2.57-km stretch between Anand Vihar and Vaishali in Ghaziabad. The Indirapuram Metro link will be an extension to the proposed Noida City Centre-Sector 62 route, which will have six stations at sectors 34/51, 71/72, 61, Mamura, Fortis, and Electronic City. NEW DELHI: A year after Delhi Metro ventured into Ghaziabad with the Anand Vihar-Vaishali corridor, it's preparing to start work on another alignment. Senior officials in Delhi Metro Rail Corporation (DMRC) confirmed that the detailed project report on a new alignment from Dilshad Garden to New Bus Terminal along GT Road in Ghaziabad had been submitted to Ghaziabad Development Authority (GDA). Work on the corridor is expected to start soon, said Kumar Keshav, director (projects), Delhi Metro. The 9.41km corridor will start from Dilshad Garden and terminate at the bus stand located near the Mahamaya Sports Stadium. "The alignment, which was earlier to terminate at Mohan Nagar has been extended to cater to a larger section," said Keshav. According to Delhi Metro, the connection to Ghaziabad via Dilshad Garden will prove beneficial not only for Delhi, but also for Ghaziabad residents as it will provide an alternative to the current Anand Vihar-Vaishali line. "There are strong possibilities for extending the line beyond New Bus Terminal in the next stage, up to Raj Nagar on Hapur Road," said Keshav. The alignment will have seven stations – at Shahid Nagar, Raj Bagh, Rajendra Nagar, Shyam Park, Mohan Nagar, Arthala and New Bus Stand. The average distance between the stations is 1.35km, said Keshav. "Discussions with the GDA have been very positive. The alignment will benefit more than 12 lakh people living in Ghaziabad," he said. Incidentally, in 2010 DMRC had proposed the extension of the Anand Vihar to Vaishali line up to Mohan Nagar. 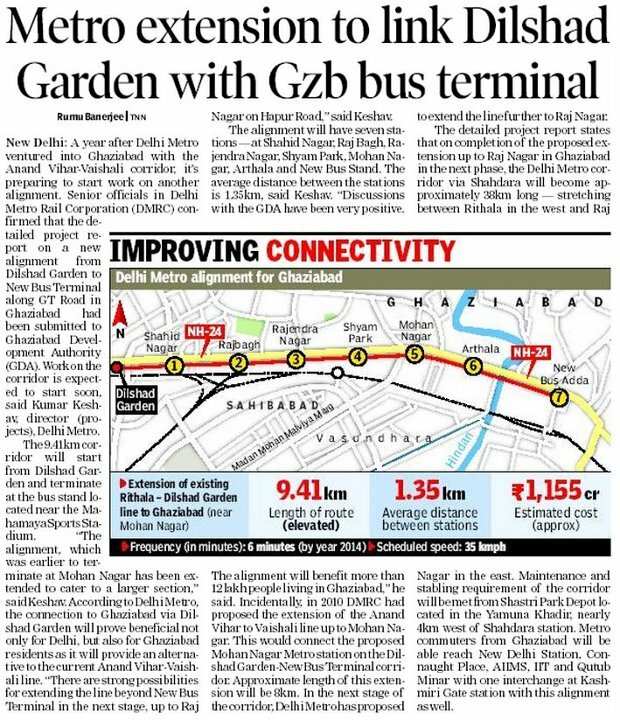 This would connect the proposed Mohan Nagar Metro station on the Dilshad Garden-New Bus Terminal corridor. Approximate length of this extension will be 8km. In the next stage of the corridor, Delhi Metro has proposed to extend the line further to Raj Nagar. The detailed project report states that on completion of the proposed extension up to Raj Nagar in Ghaziabad in the next phase, the Delhi Metro corridor via Shahdara will become approximately 38km long – stretching between Rithala in the west and Raj Nagar in the east. Maintenance and stabling requirement of the corridor will be met from Shastri Park Depot located in the Yamuna Khadir, nearly 4km west of Shahdara station. Metro commuters from Ghaziabad will be able reach New Delhi Station, Connaught Place, AIIMS, IIT and Qutub Minar with one interchange at Kashmiri Gate station with this alignment as well. When Akhilesh replaced Mayawati as chief minister, there were apprehensions in certain quarters that Gautam Budh Nagar (home district of Bahujan Samaj Party chief and former CM Mayawati's home district) comprising Noida and Greater Noida would lose the special status. The apprehensions further grew when all top officials of the Noida authority – replacements for chief executive officer and chairman are yet to come – and the police/civil administrations were changed and the government began a review of all of Mayawati's dream projects. "But the new government clarified that electoral politics aside, there will not be any comprise with infrastructure development and quality of life in Noida," said a senior authority official. The scene in Greater Noida is not much different. "The chief minister has sought a report on all stuck infrastructure development projects, especially the one for Metro expansion," said a Greater Noida authority official. A Metro expansion has been planned from Noida to Greater Noida. A detailed project report (DPR) is also ready. "The new government has put the Greater Noida Metro project on top of its priority. Fund crunch would not be allowed to halt the project any more. If need be, we will seek assistance from the Noida authority," said authority CEO Rama Raman. For residents of Ghaziabad, traffic snarls could be a thing of the past. After endless delay, the ball will soon start rolling on extending the Dilshad Garden-Rithala Metro corridor till the New Bus Stand in Ghaziabad. The decision to implement the project was taken within weeks after the Samajwadi Party (SP) stormed into power in Uttar Pradesh. Though the proposal was given in-principle approval by the previous Mayawati government, the project was stalled following funds crunch. On Tuesday, however, the SP decided to go ahead with the project following a marathon presentation submitted by Ghaziabad Development Authority (GDA) vice-chairman Santosh Yadav to state chief secretary Javed Usmani. "I had witnessed massive traffic snarls during my tenure as district magistrate here five years back. The situation is only worsening by the day. I decided to apprise the government of the current situation and it asked us to go ahead with the project," Yadav said. Talking about the funding pattern, Yadav added: "It would be carried out on a Centre-state partnership. We have to look into our accounts and contemplate how we can arrange the sum. The government has asked us to send a proposal about the mode of funding. We will do it at the earliest." The extension of the 9.41-kilometre stretch from Dilshad Garden to New Bus Stand is estimated to cost around Rs.1,591 crore. The elevated corridor would have seven stations – Shaheed Nagar, Raj Bagh, Rajendra Nagar, Shyam Park, Mohan Nagar, Arthala and New Bus Stand. The Dilshad Garden-New Bus Stand Metro link is expected to benefit more than a lakh people daily – those residing along the stretch as well as a vast chunk of the city population are likely to benefit. Moreover, a sizable number of people from adjacent towns such as Murad Nagar, Modi Nagar and Meerut, who flock to Ghaziabad daily in search of livelihood, would also benefit. A detailed project report prepared by the Delhi Metro Rail Corporation is already with the GDA. The project is likely to be completed in 2016. Of the Rs.1,591 crore that the project is likely to cost, Rs.256 crore is to be provided by the DMRC, around Rs.344 crore by the central government with the remaining Rs.991 crore to be borne by the Uttar Pradesh government. That the Metro would finally roll into New Bus Stand ought to come as good news for the people living in the area and beyond since the previous Mayawati government had almost stalled the project in April 2011 because of financial constraints. Three months later, following a public outcry, the government announced that the Dilshad Garden line would be extended till Mohan Nagar and then in August, maintained that it would be stretched to New Bus Stand. Earlier, following repeated demands, the government's infrastructure development committee had agreed to bear 50 per cent of the total cost while the remaining amount was to be jointly pooled in by the local development agencies – the GDA, the UP housing board and the UP state industrial development corporation. Though the GDA had agreed to bear its cost, the other agencies dithered, resulting in the delay. मेट्रो के लिए लगेगा डिवेलपमेंट चार्ज! अब लखनऊ से आएगी अच्छी खबर! Ghaziabad: A fast growing township bordering Delhi that has transformed from an industrial to an institutional hub, Ghaziabad, is set to see more changes. Not only will it to go hi-tech but also overhaul infrastructure, including expansion of the metro rail, more flyovers and a beautification drive, says a top official. Santosh Yadav, the newly appointed vice chairman of the Ghaziabad Development Authority (GDA) who also holds additional charge of chairman, says the agency would upload its website on Facebook and a mobile number would be displayed on it. The online interface will allow its 1.5 million residents of this western Uttar Pradesh city to air their grievances. People can even put up pictures of traffic jams, illegal constructions or any other irregularity on this account. "Not only the authority officials, but also all residents would see the real picture of the city put on Facebook shot by any member of the public. It will enable us to act fast to rectify the problem and effectively checkmate illegal construction activities," Mr Yadav told IANS. Mr Yadav, who has been brought into the GDA by new Chief Minister Akhilesh Yadav, says he plans to put Ghaziabad city on the world map, with total transparency. The authority would invite suggestions from Resident Welfare Associations (RWAs) to improve social infrastructure. Earlier, during his tenure as district magistrate of Ghaziabad, Mr Yadav mooted 12 points for the construction of flyovers. Most have been completed while some are still under construction. The construction of an alternate traffic system through the Delhi Metro Rail Company (DMRC) is also to be undertaken in the city. To help the public access the district headquarters through the metro rail, new alignments of the metro route would be explored from Noida-65 and the Vaishali metro station, Mr Yadav said. With the fast increasing population in the trans-Hindon areas and their need to approach the district headquarters, the GDA is also planning to expedite the construction of the metro route up to the Collectorate. There are also plans to beautify the city through wide roads, new flyovers, streetlights, floodlights and new entry gates. Mr Yadav said Ghaziabad would open new routes of development to the adjoining districts of Meerut and Panchsheel Nagar. This city, strategically located between two important railway routes, Delhi-Kolkata and Delhi-Dehradun, as well as three national highways, NH-24 to Lucknow, NH-58 to Dehradun, and old Grand Trunk Road to Kanpur, plays an important role in the country's economic development. Traditionally, a city of foundries, Ghaziabad now has northern India's biggest steel yard, courtesy the Steel Authority of India (SAIL). It boasts of fast developing real estate activity along with huge reserves of underground water for crops. It has lately also attracted a slew of educational institutions. Mr Yadav promised that even in the face of development the dignity of the city would be maintained. दिलशाद गार्डन से टूटा दिल! Facing a fund crunch for the second phase of Metro, the Ghaziabad Development Authority (GDA) has sought the Delhi Metro Rail Corporation's (DMRC) help in exploring various possibilities to fund its second phase of Metro extension in Ghaziabad. Ghaziabad between DMRC and authority officials to decide how to fund the 7.31-km second phase project from Dilshad Garden to Arthala (near Mohan Nagar) in Ghaziabad. "We discussed various funding structures with the DMRC. Funding the project on a public-private partnership (PPP) mode could also be a possibility," authority vice-chairman Narendra Kumar Chaudhary said. The second phase project is estimated at around Rs 1,282 crore, out of which Rs 815 crore will be borne by the GDA. “We are exploring new possibilities and have called another meeting,” Chaudhary said. The joint funding patterns for development of phase II of Metro line in Ghaziabad are changing frequently as the officials from various agencies have now requested the state government to provide 50% of the funding, as local agencies have shown their reservations about the provisions for funding. In a recent meeting held at the office of commissioner (Meerut), these officials decided that out of the total cost of R815 crore, 50% would be requested from the state government and the remaining would be shared by the Ghaziabad Development Authority (GDA), municipal corporation, UP State Industrial Development Corporation (UPSIDC) and Avas Vikas Parishad. In a previous allocation, around a fortnight back, the 50% of the funding for phase II were to be borne by the GDA and the remaining by the other three agencies. “During the meeting, these agencies were not very upbeat to share the funding. It is now decided to ask the state government to contribute 50% of the cost. If they don’t, we will again revert to the previous funding pattern,” GDA vice-chairman Narendra Kumar Chaudhary told HT. The phase II of the Metro line in Ghaziabad will be an extension from Dilshad Garden (in Delhi) to Arthala (near Mohan Nagar), a stretch of over 7.31 km. The funding for the phase II extension has always been shrouded with uncertainties as the GDA receives only R150 crore as infrastructure development fund every year. It is not possible for the GDA to meet out the entire cost on its own in a span of three years. Previously, the GDA solely contributed around R300 crore for the Metro phase I, from Anand Vihar to Vaishali. Besides, GDA’s proposal for funding phase II of the Metro extension through levy of Metro cess on new housing project was also turned down earlier. However, the GDA has been asked to set aside a reserve of R100 crore to be paid to Delhi Metro Rail Corporation (DMRC), once the memorandum of understanding gets signed for the said project.